If you follow thekeytochic on Instagram, then this may look familiar. It's my wish list for the Jason Wu for Target collection, which I shopped today bright and early. Fortunately, my store had a reasonable selection, although no scarves were to be found. I also shopped online at 10:30 last night, and with lots of refreshing, multiple browsers open, fast clicking, and plenty of patience, I was able to order the items I wanted as they became available via updates from the TargetStyle Twitter account. *Dress sizes run big, and go from 2-16 or XS to XL. I recommend going down a size. *Tops run true to size, and go from XS to XL. Beware of poor quality snaps on the polka dot bow blouse. *Most popular piece? The navy poplin dress with the stripes at the hemline. It sold out with 2 minutes at my store. The navy floral dress and wheel print dress (which I liked) were still lingering on the racks when I left at 9am. *The dresses are true to Jason Wu's aesthetic. They have great attention to detail, fun prints, and elegant, timeless silhouettes. *Store inventory was lowest for the handbags at my store, although most apparel items had about 4 of each size when the store first opened, which is more than usual for these Target collections. The bags were gone in under 5 minutes at my store. It got really crowded as the women descended upon the clothing racks, but everyone was friendly and calm. *Check the fitting room go-back racks for items not found on the floor. Lots of women were trying things on only to return piles to the fitting room attendant due to fit/quality issues. *It's necessary to arrive well before the 8am opening if you want to snag the pieces on your wish list. Just how early depends on how close you are to a large city, the density of Target stores in your area, how style-conscious your area is, and how much sleep you're willing to lose. My store had fewer than 30 people by 8am, including some dedicated boyfriends and husbands, who were lined up single file. I was third in line at my store, and I did as well as I could have done given my store's inventory. I somehow managed to give an interview with a reporter about blogging and shopping Target's capsule collections. 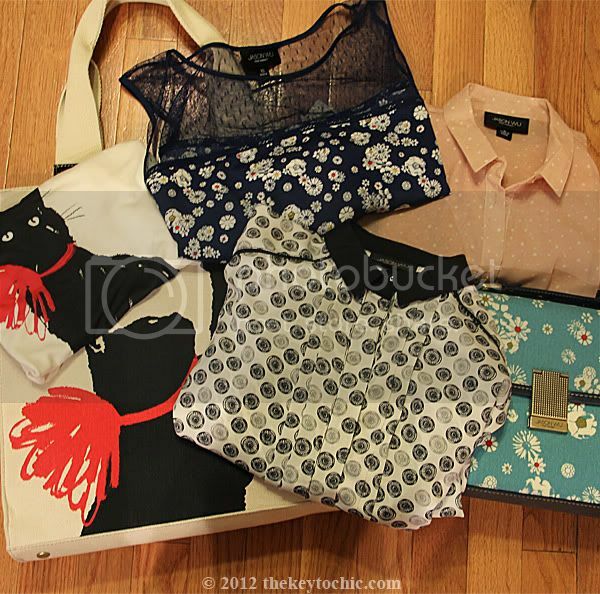 In the end, I left the store with: the cat tote, floral flap bag, some tops, and the dot print shirtdress. Luckily, the clothing pieces that I wanted were the things that others did not. I'm looking forward to receiving the red cardigan, navy floral skirt, and cat scarf later this week if my orders ship. *Update - for a more visual look at the collection with personal style photos and a new twist, read my Jason Wu for Target review. If you shopped the collection, what did you get, how was your experience, and what did you think?